2 Bedrooms, 1 Bath, Sleeps 3 with views of the mountain. Our lovely spacious cottage boasts its own private driveway and has a large sitting room, fully equipped kitchen, bedroom with a four poster bed and a full en-suite bathroom (with a bath and separate shower). Another room adjacent to the bedroom contains a single bed and wardrobe. A private patio has views of the lush gardens and mountains. An access gate across the road takes you straight into Groot Constantia vineyard, where you can walk through the vines for a spot of winetasting or sample one of the two superb restaurants on the estate. There is cable TV and wifi in the cottage. The large ensuite bathroom has a bath with shower and a separate shower cubicle. I provide local luxury brand Charlotte Rhys toiletries on arrival, to get you started. There will be soap, shower gel, body lotion, shampoo and conditioner. I will also provide a couple of loo rolls for the start of your stay. You will find beautiful white fluffy towels for use during your stay. There is large fan for your use. We have 2 radiators for the cottage in winter. The washing machine is also a tumble dryer. There is a covered parking area for you car. Also a large driveway with space for many cars! There is wifi in the cottage. I also supply a portable dongle so you can have wifi in your car or when you are out and about. Very handy if you need to use google maps! There will be a starter pack of tea, coffee, sugar and milk in the kitchen for your arrival. The is a BOSE for your use and an iPod with music. There are 4 outdoor sofas on the patio and also a wooden table and 4 chairs so that you can enjoy breakfast, lunch or dinner in the garden under the shade of the trees. The property is cleaned with towels and sheets changed on Tuesday and Friday. Check in is after 2pm and check out is before 11am. No check in on Sunday. We spent 2 months at this cottage. Fantastic location. Free of traffic noise and excellent access to shopping, restaurants & major highways. The outdoor area was private with beautiful gardens. Really loved the outdoor patio area. The cottage was well appointed with an excellent kitchen. Melissa went out of her way to ensure our comfort. Definitely would stay here again. Dear Gail and Frank, it was so lovely to have you stay with us and to get to know you. I'm glad you had a lovely holiday with and would love to welcome you again to Cape Town. What a pleasure to spend time at the cottage. The most wonderfully private garden, we enjoyed our month here very much and plan to return next year. Constantia is a very convenient location to explore from. All in all a very happy and successful trip. Everything was perfect at the cottage, what an amazing place to stay! We enjoyed being able to walk through the vineyard to enjoy dinner and wine tasting. Melissa was an incredible host, we couldn't recommend the cottage more. I'm so glad you enjoyed your stay. You were perfect guests! It was great to meet you and Britt. I hope you enjoyed your last few days in Cape Town and please come back and visit again! 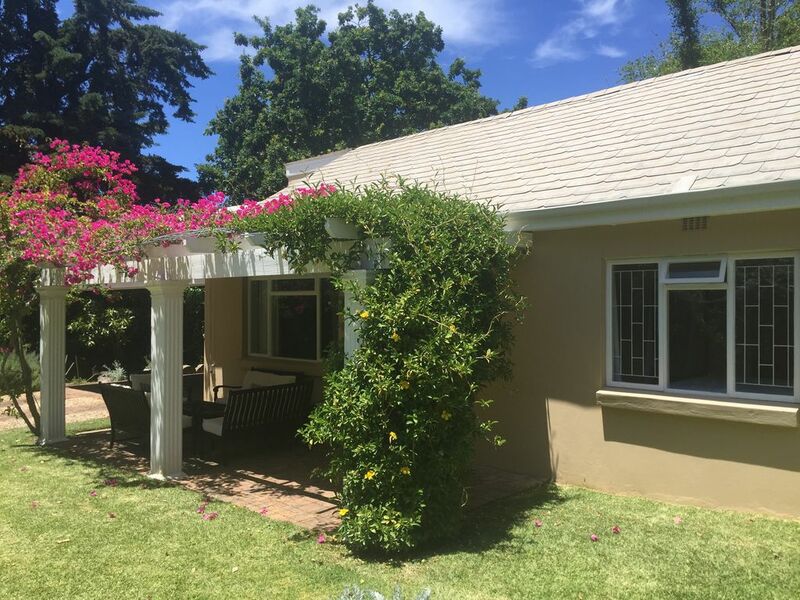 Tranquil gorgeous cottage in the heart of constantia winelands. Highly recommended. Melissa is an amazing host! Had very enjoyable chill out time at the cottage. Well equipped and comfortable. It is very quiet with private driveway to the property. Melissa on hand if needed. The three dogs were very friendly but not intrusive. Hope to come back soon. The cottage is in a secluded part of the garden of the larger house lived in by the landlady, and is approached via a separate driveway which has a secure gate. It offers good privacy. Melissa was extremely helpful and also completely respectful of our privacy. She brought us chilled wine on our arrival. There are 3 very friendly dogs which only occasionally wandered near the cottage, and were quiet and no problem whatsoever. The cottage and garden were delightful, and we enjoyed spending time here relaxing, and not feeling we needed to be out all of the time. The Constantia area is very nice has a safe feel. The cottage feels secure. The Groot Constantia vineyard is right on the doorstep and is an excellent half day visit (that's whether or not you want to taste the excellent wines). Kirstenbosch is also very close by and is a definite must visit. Very happy to recommend this accommodation to others. Thank you for your lovely review. It was so nice to meet you both. I really glad you enjoyed your stay and relaxed in the peace of the garden. I would love to welcome you both back to Constantia one day and maybe even bump into Sandra in my home town! The cottage is no smoking and we hope our guests will be pet friendly. We have 2 Boston Terriers and 1 French bulldog who might pop round to say hello!